Eva Cincotta is a native of Malden and resides in Melrose, Massachusetts. She is a graduate of the School of the Museum of Fine Arts, and Tufts University. Eva is a full time artist and teacher, besides demonstrations and workshops, she has taught at several local colleges and exhibits in regional galleries. 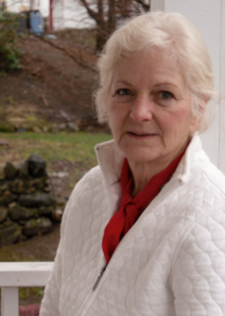 She is member of The North Shore, Rockport Art Associations, and the Malden Sketch Group. There is a certain satisfaction with combining the tension of space, balance, and subject matter to create the most comforting relationship. I love the idea of painting ordinary mundane subjects and transforming them into colorful imagery. My work shifts from the attempt to present the world as it is and find the unusual positions to bring out the character that the usual onlooker may not see, such as a crooked street or leaning building. My idea is to stay focused on the fundamental relationships as an unfinished study while enjoying the beauty of colors coming against one another. This is an energizing and invigorating process as one moves to refining the subject to a simple point of view. Color and light, for me, always take on the role of transporting images to another era that provides nostalgia and the memories of a simpler time. My urge is to always leave the viewer with a sense of past tranquility that may give a moment’s pause within our busy days.